Yukiji gleefully inflicts the massive “enemy of summer vacation” homework massive book on her students, which is refereed to as a “blunt weapon” due to its size. The book, filled with the summer homework for Hakuou Gakuen students. Maria sees this and has a happy, nostalgic feeling over it, having done this amount of homework when she was ten. 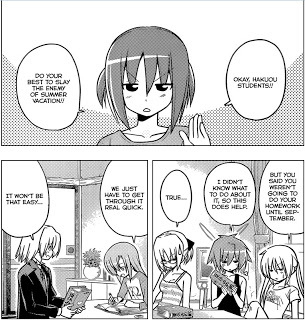 Nagi explains to Hayate that homework is like a game to Maria. Hayate recalls that Maria was the one who used to tutor Nagi, leading Nagi to credit Maria for her current good grades. Ayumu comes home and sees the “blunt weapons” on the table, and is surprised to learn that this is their homework. She says that she thinks she has some summer homework, leading Nagi to speculate that Ayumu is planning to wait to do it on the first day back at school. Upon hearing that none of the Hakuou students will be able to have any fun until they’ve done this homework, Ayumu sees her fun-filled summer with Hayate being destroyed. So, with Ayumu’s support, the group starts on the homework. Ah-chan sees them working and asks Maria about it, which Maria replies it is their duty as students. Maria asks Ruka if she has summer homework, but Ruka is not in high school since she is an idol, thus she chose her work over school. However, now that she thinks about how she quit being an idol, she wonders what she’s doing with her life. 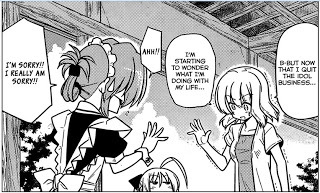 That night, Ruka lays awake, worried about her future now that she’s cast her lot on being a manga-ka instead of being an idol. She gets up to make some tea, only to find Hayate in the kitchen. He makes her some tea and she asks about the homework, which is not going well for himself and Kayura. 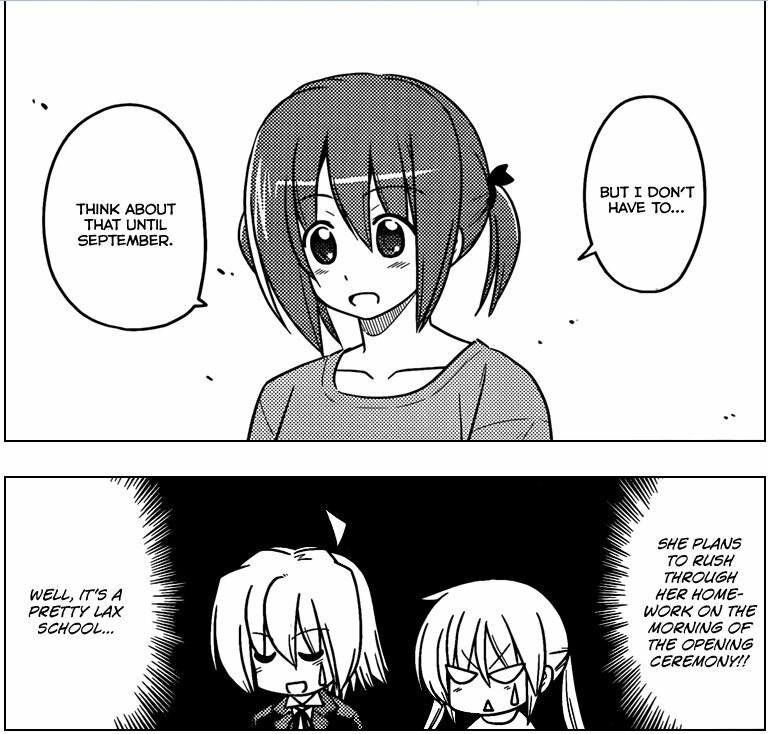 Ruka encourages him to keep at it and Hayate encourages Ruka to keep at her manga. This causes Ruka to have a panic attack as she worries about things. To make matters worse, she ends up coughing up blood. Interesting how Hata-sensei started this chapter as a gag chapter about the insane amount of homework the Hakuou students have to going to what appears to be an advancement and new development in the Ruka plot thread. 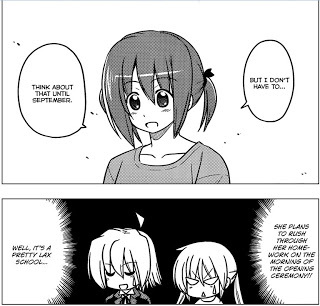 On the summer homework in Japan, I really am thankful that the fall was the START of the school year in the U.S. whereas in Japan, it is in spring. Thus, there was never any real summer homework for me growing up, though we would get a recommended reading list for literature class (which I would attempt to read since I loved reading books, but I only stuck with the books I actually found interesting). As to Ruka, I can certainly sympathize with her panic attacks and worries about the future. I certainly remember going through something similar at the tender age of 19, when I realized my dreams of working with Artificial Intelligence in college had gone up in smoke since the money I needed to pay for school had vanished. As such, I ended up joining the Air Force to survive, which was a very scary course change for me, but it was a decision that caused me to get to live in Japan for two years, leading me to where I am today. Since Ruka started coughing up blood, I went to WebMD’s site to look up possible causes. This is the list of what might cause Ruka’s condition. I think we can rule out crack cocain, but Hata-sensei has a wide range of conditions to give Ruka. I wonder where this will go. One final item of interest is the color page, which stated that Hata-sensei did more that three volumes worth of storyboards for the new anime series. I do plan to watch the new anime just to see what he came up with. In the end, we have a chapter that starts off one place and ends up somewhere else. I’m hoping that we learn more next chapter, but I tend to suspect that Hata-sensei will have Ruka hide the fact that she’s coughing up blood until it becomes life threatening.